when I cut my wrists to bleed to death the other day? and yet I scratched my tough skin mercilessly. but the world was asleep when I uttered my sobbing cry. which made me want to swoon in a faint. in strands from my open wounds? a woeful tune to the god of death. but I saw nothing but darkness before my eyes. I fell backwards and hit my head against a glass mirror. as I sounded to the universe my silent scream. when I pulled my skin from my white bones? to be separated from my dark red and black muscles. salted my wounds and made my flesh burn. where I lay down in a pool of bile and blood. when I started to stab my body with a blade? washing me with filthy body fluids. but the cosmos had turned its head away from me. till I forget the past or the past forgets me. Wow, as far as metaphors go, that was amazing. 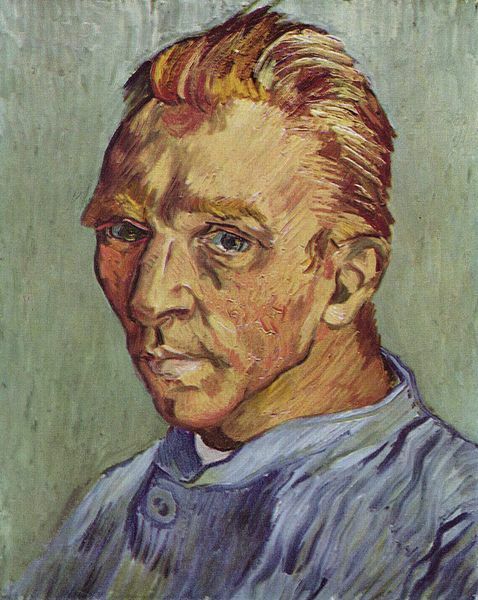 And that portrait – you gotta love Van Gogh, I do.